From July 25 to September 23, 2001, red rain sporadically fell on the southern Indian state of Kerala. Heavy downpours occurred in which red-colored rain fell, staining clothes with an appearance similar to that of blood. People reported yellow, green, and black rain also. Initially, scientists suspected that fallout from a hypothetical meteor burst colored the rains, but a study commissioned by the Government of India found that the rains had been colored by airborne spores from a locally prolific terrestrial alga. Then in early 2006, the colored rains of Kerala suddenly rose to worldwide attention after media reports of a conjecture that the colored particles constituted extraterrestrial cells, proposed by Godfrey Louis and Santhosh Kumar of the Mahatma Gandhi University in Kottayam. An investigation into the isotopic ratios of nitrogen and carbon supported the terrestrial origins of the solid material in the red rain. The unexplained nature of the red rain phenomena in Kerela has led to speculation of a dramatic sort. Some have postulated that the red rain constitutes a form of hypothetical microorganism called panspermia. The few scientist who advance the theory of panspermia postulate that those mircoorganisms began life on earth and throughout the universe, denoting an explanation for the origin of life called the proto-domain theory. As long as an explanation of the red rain phenomenon remains unexplained, theories outside the mainstream like the prot-domain theory will continue to have a following. The colored rain of Kerala first fell on 25 July 2001, in the districts of Kottayam and Idukki in the southern part of the state. Some reports suggested that other colors of rain had been seen also. People reported many more occurrences of the red rain over the following ten days, and then with diminishing frequency until late September. Red particles in suspension in the rain water caused the coloration of the rain, and the red rain appeared at times as strongly colored as blood. It typically fell over small areas, no more than a few square kilometres in size, sometimes so localized that normal rain could be falling just a few metres away from the red rain. Red rainfalls typically lasted less than twenty minutes. Initially the Centre for Earth Science Studies (CESS) had suggested an exploding meteor caused the red rain. A few days later, when the red rain continued to fall, they retracted that. (Clearly debris from a meteor would have covered a wider area.) Instead, the announcement jointly from the CESS and the Tropical Botanical Garden and Research Institute (TBGRI) concluded that the particles colouring the rainwater constituted some type of spore. Then in November of 2001, commissioned by the Government of India's Department of Science & Technology, the CESS and TBGRI released a report which concluded that algal spores colored Kerala's rains, successfully grown in medium into lichen associated algæ of the genus Trentepohlia. Although red or orange, Trentepohlia constitutes a Chlorophyte green alga which can grow abundantly on tree bark or damp soil and rocks, also constituting the photosynthetic symbiont or photobiont of many lichens, including some of those abundant on the trees in Changanacherry area. The report noted an absence of dust of meteoric, volcanic or desert origin in the rainwater, concluding the cause of the color of the rainwater other than dissolved gases or pollutants. The report suggested that heavy rains in Kerala in the weeks preceding the red rains could have caused the widespread growth of lichens, which had given rise to a large quantity of spores in the atmosphere. It found no definite mechanism for the apparent extraordinary dispersal of the suspect spores, nor for the uptake of the suspect spores into clouds. The authors of the report analyzed some sediment collected from the red rains, using a combination of ion-coupled plasma mass spectrometry, atomic absorption spectrometry and wet chemical methods. The major elements found follow. The presence of aluminum and the very low content of phosphorus puzzled scientists because of the absence of aluminum in living cells, while normally about 3 percent phosphorus can be expected in the dry weight of biological cells. The CESS analysis also showed significant amounts of heavy metals in the red raindust, including Nickel (43), Manganese (59), Titanium (321), Chromium (67) and Copper (55) (amounts in ppm), though the report omits comment on that. History records many instances of unusual objects falling with the rain—in 2000, in an example of raining animals, a small waterspout in the North Sea sucked up a school of fish a mile off shore, depositing them shortly afterwards on Great Yarmouth in the United Kingdom. Colored rain has occurred before, often explained by the transport of dust from desert regions in high pressure areas, where it mixes with water droplets. One such case occurred in England in 1903, when dust transported from the Sahara and fell with rain in February of that year. At first, scientists attributed the red rain in Kerala to the same effect, with dust from the deserts of Arabia initially the suspect. LIDAR observations had detected a cloud of dust in the atmosphere near Kerala in the days preceding the outbreak of the red rain  That hypothesis failed to explain certain aspects of the red rain, such as its sudden onset and gradual decline over two months, and its localization to Kerala despite atmospheric conditions that should have seen it occur in neighboring states as well. Another theory postulates that the rain contained mammalian blood, a large flock of bats having been killed at high altitude, perhaps by a meteor. Some bat species in India live in very large communities. 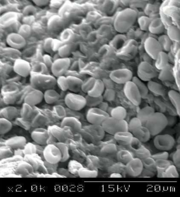 An absence of bat wings or other remains found raining from the sky, along with no known natural process would separate the red blood cells from white cells, platelets and other blood components, has led scientists to discount that possibility. 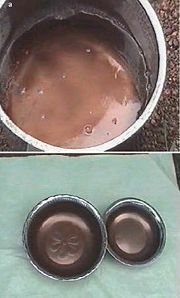 Red blood cells disintegrate rapidly in regular rainwater because of osmosis; in this case, no evidence supported that. Furthermore it would have had to be a sizable quantity of bats to cover a province of India. In 2003 Godfrey Louis and A. Santhosh Kumar, two scientists at Mahatma Gandhi University in Kottayam, Kerala, proposed another hypothesis. Having collected samples of the rainwater at many locations, Louis and Kumar claimed that rather than appearing like dust, the red particles appeared to be biological cells. Chemical analyses indicate that they consist of organic material, and so they proposed that the particles may be microbes of extraterrestrial origin. Louis and Kumar's analysis found that the red particles typically measured 4 to 10 µm across, spherical or oval in shape, and similar in appearance to unicellular organisms. On average, 1 millilitre of rain water contained nine million red particles, and the particles in each litre of rainwater weighed 100 milligrams. Extrapolating those figures to the total amount of red rain estimated to have fallen, Louis and Kumar calculated that a total weight of some 50,000 kilograms of red particles had fallen over Kerala. Energy dispersive X-ray spectroscopy analysis showed that the particles were composed of mostly carbon and oxygen, with trace amounts of silicon and iron (see table). A CHN analyzer showed 43.03 percent carbon, 4.43 percent hydrogen, and 1.84 percent nitrogen. Louis and Kumar performed tests with ethidium bromide in an attempt to detect the presence of DNA or RNA in the red particles, but found none. They published the results in the journal Astrophysics and Space Science. Milton Wainwright, who has studied stratospheric spores, carried out further tests on the particles at Sheffield University. In March 2006 he said the particles bore similarity in appearance to spores of a rust fungus, later saying that he had confirmed their similarity to spores or algae, and found no evidence to suggest that the rain contained dust, sand, fat globules or blood. He also said; “There appears to be an increasing tendency among scientists to come up with wild explanations when asked by the press to comment on unusual, novel phenomena. A good example is provided by comments about the recent Indian red rain phenomenon.” A correction was printed in The Observer regarding Dr. Wainwright's comment that the red rain lacked DNA. Dr. Wainwright asked in the correction to make clear that he currently had suspended judgment on whether the samples contained DNA and that physicist Godfrey Louis holds that view. The controversial research of Godfrey et al. constitutes the only evidence suggesting that those organisms constitute extraterrestrial organism. Godfrey suggests those microbes could be a prehistoric domain of life, or a Proto-Domain. Scientists sent a sample of the rain to Cardiff University for analysis by noted panspermia proponent Chandra Wickramasinghe. Wickramasinghe has reported on the 30th of March 2006 that “work in progress has yielded [sic] positive for DNA”. 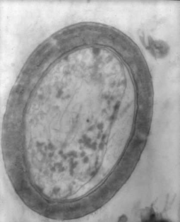 A single grain viewed with a transmission electron microscope, purportedly showing a detached inner capsule. A few hours before the first occurrence of the red rain, residents of Changanasserry in Kottayam district reported a sonic boom, accompanied by a flash of light. Louis and Kumar suggest that the disintegration of a small comet entering the Earth's atmosphere caused that, the comet containing large quantities of the red particles. Observations show that 85 percent of the red rain fell within ten days of 25 July, and Louis and Kumar considered that consistent with the settling of red particles released into the upper atmosphere by a cometary break-up. Subsequent research by a different group of scientists postulated that the red particles constituted spores of the alga Trentepohlia, but may simply be contamination from the lichens that grow abundantly in the region. Louis and Kumar consider the particles cells, representing evidence of extraterrestrial life. If biological in nature, and scientists discount the theory of origin from a comet, Louis and Kumar may have provided the first evidence in favor of the theory of panspermia, in which life on Earth may have been carried here from elsewhere in the universe. Fred Hoyle and Chandra Wickramasinghe have been among the proponents of the theory, but it has been dismissed by most mainstream scientists. The newly hypothesized tree of life. 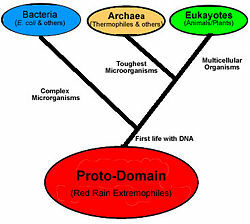 To date, red rain represents the only supposed evidence of the existence of proto-domain organisms. Proponents of the proto-domain theory argue that the "cells" in red rain lacked DNA providing evidence that they constitute something other than algal spores. Mainstream scientific opinion regards the existence of proto-domain organisms as at best a hypothesis and at worst as wild speculation. Critics also argue that the lack of DNA represents weak proof that those organisms constitute either prehistoric or extraterrestrial, noting, "further work in progress has yielded positive for DNA using [DAPI] staining in the cells and daughters." That identification awaits confirmation, and might be considered equivocal. 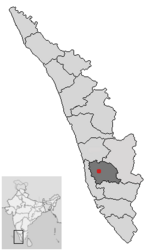 Reports say that on August 21, 2007 red colored rainfall occurred in a few places in the northern part of Kozhikode district. Places around Vadakara, a municipality in Kozhikode district, situated fifty kilometres northward of Kozhikode town witnessed that phenomenon. Centre for Water Resources Development and Management (CWRDM) an agency of government of India, reported waiting for samples to examin. ↑ Roy Mathew July 28, 2001, The Hindu: Multicolor rain.Retrieved February 21, 2008. ↑ Venkitesh Ramakrishnan. 2001. Colored rain falls on Kerala. BBC. accessdate March 6, 2006. ↑ M.G. Radhakrishnan. 2001. Scarlets Of Fire. India Today. accessdate March 6, 2006. ↑ Now wells form spontaneously in Kerala. Times of India. 5 August 2001. ↑ Kamal Gopinath Nair. Monday, August 6, 2001: ‘Red rain was fungus, not meteor’.www.indianexpress.com.Retrieved February 21, 2008. ↑ Chris Benfield Is mysterious ‘red rain’ first evidence of life in space?—Yorkshire Today.Retrieved February 21, 2008. ↑ Louis and Kumar  "New biology of red rain extremophiles prove cometary panspermia. "Retrieved February 21, 2008. ↑ Wickramasinghe.Cardiff Centre of Astrobiology: Analysis of red rain of Kerala www.astrobiology.cf.uk. ↑ Colored Rain: A Report on the phenomenon . Retrieved February 21, 2008. ↑ Skepticism greets claim of possible alien microbes. www.worldscience.net. ↑ Gentleman and McKie The Guardian.Retrieved February 21, 2008. “Skepticism greets claim of possible alien microbes” in World Science. “Red rain could prove that aliens have landed” by Amelia Gentleman and Robin McKie in The Observer. “When aliens rained over India” by Hazel Muir in New Scientist. Possible Causal Mechanism of Kerala's Red Rain. “Searching for 'our alien origins'” by Andrew Thompson in BBC News. "Red rain controversy" by David Tenenbaum in "The Why Files". Cometary panspermia explains the red rain of Kerala. New biology of red rain extremophiles prove cometary panspermia. History of "Red rain in Kerala"
This page was last modified on 6 July 2015, at 22:59.